After decades working in agricultural research and development, not a day goes by at The Climate Corporation that I don’t marvel at the pace and significance of the scientific discovery happening right here. With hundreds of the most focused, committed and just plain passionate people in the field working in Climate R&D and on my team, we’re developing innovations at an unprecedented pace. Even more importantly, we’re committed to our mission of helping the world’s farmers sustainably increase their productivity with digital tools. Because digital agriculture is such a new and quickly advancing research space, today we’re announcing a significant shift to how we communicate our R&D work at The Climate Corporation. With the most robust pipeline in the digital agriculture business, it’s my privilege to showcase our research advancements at a breadth and depth never before seen in the technology sector. 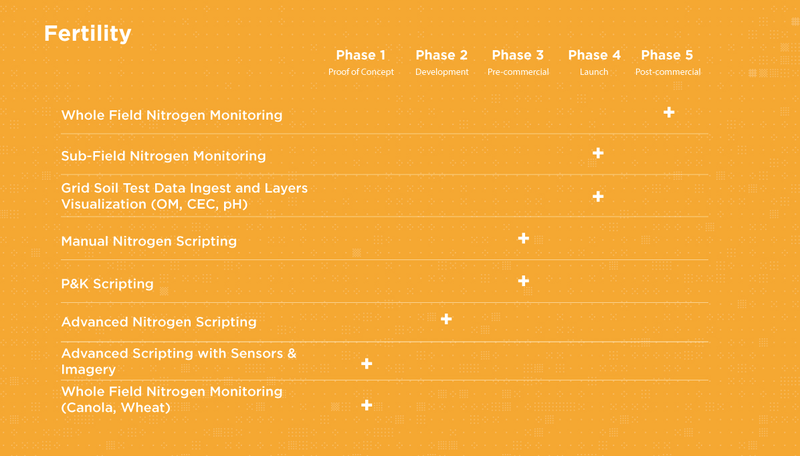 Before I get to a few of my favorite highlights from our R&D pipeline announcement, I want to offer you some perspective on our expansive testing network whereby each project is evaluated and validated before graduating to our customer platform. The Climate FieldView™ platform is backed by farm-scale, science-based research that is unmatched in the digital ag industry. In addition to extensive development, agronomic modeling and deep learning algorithms, our projects go through field testing with the industry’s only farm-scale research and testing program pioneered by our team. Typically in agricultural research, you’ll find small test plot studies that use researcher – not farmer – equipment to validate a product. While this works for many product development applications, at Climate, we believe the best way to deliver farmers field-ready digital agriculture tools is to test them like a farmer would – broadacre design and across our customers’ growing environments. To achieve this, we’ve invested in research farms across the Corn Belt that, paired with our research partner network, account for nearly 40,000 acres. This level of diversity at scale gives us the insight we need to build the best, most tuned digital agriculture products for our customers. We also continue to expand how and where we collect field data. We collaborate with research programs across Monsanto, including breeding, biotechnology and microbials, to aggregate field data for products that are still in development. These unique streams of data, in addition to those collected by Climate FieldView customers, provide large acre insights and field specific knowledge, help us evolve our tools and ultimately, enable us to bring the farm to life. It’s our belief that this rigorous data collection, testing and validation is what has earned the 100 million acres mapped using the Climate FieldView platform to date. Now to my favorite part – sharing some of the exciting science in our R&D pipeline for the Climate FieldView platform. We have several, novel research initiatives underway including: P&K fertility insights, product seed selection guidance by region and field, field health insights on disease vulnerability modeling and more. Expanding Fertility Research to Phosphorous (P) & Potassium (K) – Efficient fertility management is key for farmers because crop nutrition has a significant impact on yield, and is one of the most expensive inputs. We are developing the industry’s first comprehensive fertility solution to provide farmers with detailed, customized insights for key management decisions. By adding P & K to our fertility research, we’re a step closer to our goal. And through agronomic models, we are developing manual scripting tools to provide farmers with fertility prescriptions tailored to their unique goals, and working to provide farmers with insights on how crops will respond to a fertilizer application so they can quickly determine which field needs an application, as well as which areas of the field are in greatest need. Product Selection Research – Like fertilizer, seed is one of the most expensive inputs on the farm, and placing the right seed in the right location is critical to maximize the yield opportunity of each seed. 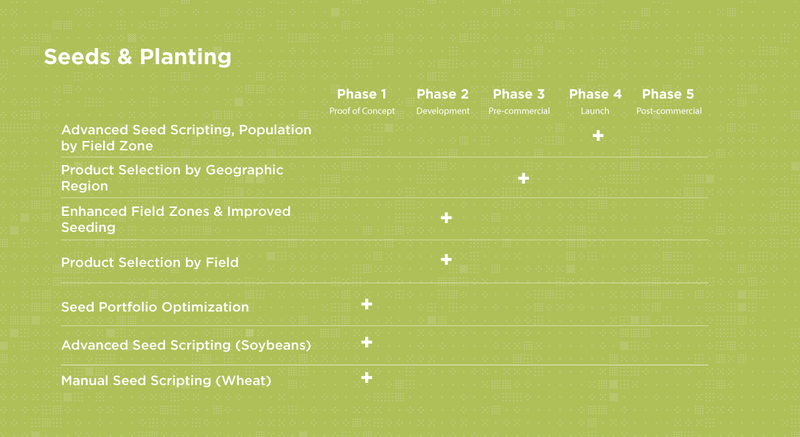 The sophisticated science behind our advanced seeding scripts, combined with the platform’s ability to collect and analyze field data across many geographies, now enables farmers to build a customized plan by management zones, assign optimized seeding rates within field zones, and compare scripting scenarios for their field. Through this research, we’re revolutionizing seeding management by developing new and customized approaches to determine the best seed for a farmer’s geographic region and specific field. Disease Insights for Field Health – Every farm is different. Every field is unique. Farmers are managing large operations today, making precise management of multiple fields a challenge. Our R&D efforts are focused on providing data that helps farmers see what’s happening in every field, prioritize their in-season crop management, and use field data to make important input decisions for the next season. We’re currently working on tools to help assess a field’s vulnerability to certain diseases – like gray leaf spot and northern leaf blight – based on environmental and genetic variables. We are also using artificial intelligence to predict and diagnose diseases in corn, soy and wheat. These are just a few of the innovations our team is working on right now. Bridging the technology and agriculture sectors means we’re moving more quickly and agilely than any other type of agricultural research program. While we’ve got our collective nose to the grindstone building these tools for the farm, I wanted to take a moment to pull back the curtain and share our work with you. 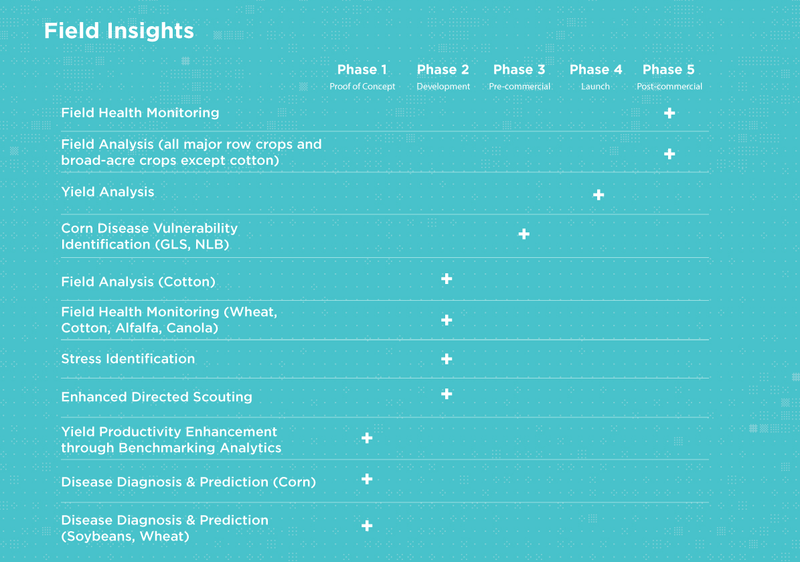 We’re singularly focused on helping improve crop yields through the most advanced solutions data science has to offer. On behalf of our teams at Climate, I thank you for your interest and I can’t wait to share with you the progress we’ve made and new research efforts next year!